My work issued laptop, a.k.a. The One Running Windows, is having a CPU usage issue. While I work, the CPU usage climbs until it can't climb no more. It then sticks around 100%, making it very difficult to work. Try working without any spare CPU... it's very little fun. Naturally, I've been trouble-shooting this sunofabitch like crazy. At first I blamed my beloved Firefox, but a switch to Chrome didn't help matters. Then, I thought it might be Songbird, but a move to iTunes spelled no relief. Eventually, I detected a correlation between the use of my mouse and spikes in CPU. Not just the external mouse though, but also the touch pad. After troubleshooting this damn mouse - CPU thing for a few hours, I remembered it's not my laptop. I don't own it, I just use it. So, I did what I should have done long ago. 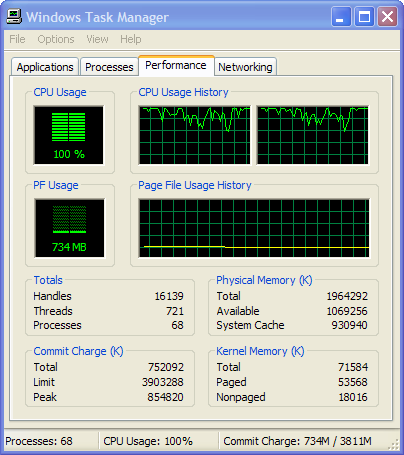 Not that it matters but does the processes tab not show which process is chewing up all of the CPU? It's whatever application the mouse goes over - so it doesn't matter if it's Firefox, Chrome or IE, it blows up. You have have a virus. It is common for it to use up all your CPU. It may be the Virtumonde virus. Very nasty. My new laptop has been ordered. They'll do a fresh install of XP on my old one and give it to the new inside sales guy. Only 5 comments? C'mon, we can do better... Leave a comment above and let's keep this conversation going!